Let's keep going with the recycling theme today! While I was doing my recycling research last night I stumbled upon information that was new to me about issues recycling pizza boxes. When we still had the dual-stream recycling we were notable to recycle pizza boxes. It never made sense to me since they are cardboard and cardboard is recyclable. When we were switched over to single-stream recycling and they sent us the new list of everything that could and could not be recycled, pizza boxes were not mentioned at all. So I figured that we could recycle them now and that is what I have been doing for the past year. Oops. "Food is one of the worst contaminants in the paper recycling process. Grease and oil are not as big of a problem for plastic, metal and glass, as those materials are recycled using a heat process. But when paper products, like cardboard, are recycled, they are mixed with water and turned into a slurry. Since we all know water and oil don’t mix, the issue is clear. Grease from pizza boxes causes oil to form at the top of the slurry, and paper fibers cannot separate from oils during the pulping process. Essentially, this contaminant causes the entire batch to be ruined. This is the reason that other food related items are non-recyclable (used paper plates, used napkins, used paper towels, etc)." Ah-ha!! OK, so NOW it is starting to make sense! What can we do? If you are like my family we get pizza on a regular basis so almost every week we have a pizza box to depose of. If you want to recycle it, and you should, simply cut out that oil stained parts and throw those away. The unstained remains can then go into your recycling bin. But do not try to put the whole thing in if it has oil stains. This lead to contamination which costs the industry millions of dollars each year. I've been guilty of this or the past year but now I know better. Our company specifically says we can recycle pizza boxes - weird. I suspected this, but now I know for sure. Often our pizza place puts wax paper between the pizza and box, which minimized the grease on the bottom. I don't mind cutting out the greasy parts prior to recycling. Thanks for the tip! 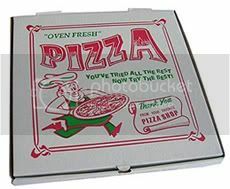 I'd often wondered about this--usually we just recycle the top of the box and throw the bottom out... now I will start to cut off the greasy parts on the bottom to recycle the rest too! Found you from momdot.com on the mr. linky...great site!